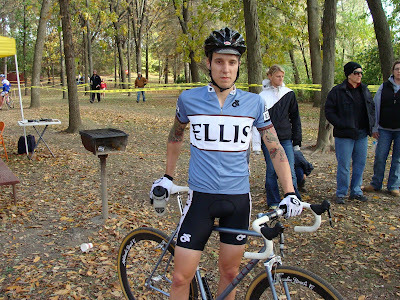 Headed out to Gibbs lake near Janesville this past Sunday to watch the cross races and see James in his spiffy new Ellis jersey and shorts. 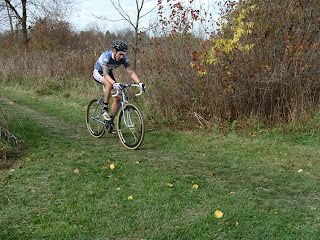 On Saturday James raced in Verona, near Madison and took 3rd place, congrats! 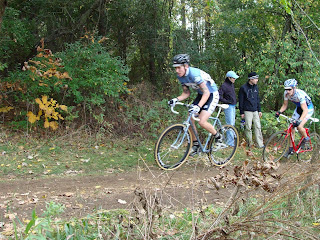 But I think the fatigue was getting to him on Sunday, he looked to be suffering but still managed a respectable 5th. I'm still getting used to the new camera, so I haven't got the focus quite dialed in. The trees and background are sharp, but James in kinda blurry. Rolling up to the barriers and running like hell. Don't look so unhappy James, there's always next week! 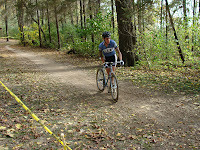 On the 26th, the race is in our back yard at Washington Park in Milwaukee. Ellis Cycles will be there to support James and we'll have a tent with some really pretty bikes to check out, including James'. 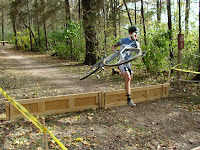 Stop by and say hi, you might even see me racing in the Cat 4 race, hopefully I can stay upright! Is the Ellis clothing available to anyone? Anyone can order Ellis jerseys and shorts. This first run of clothing I only ordered a few extra pieces for stock, if you're interested let me know what you'd like, I may have it in stock. If not, I'll be doing another order prior to the Handbuilt show in Feb.